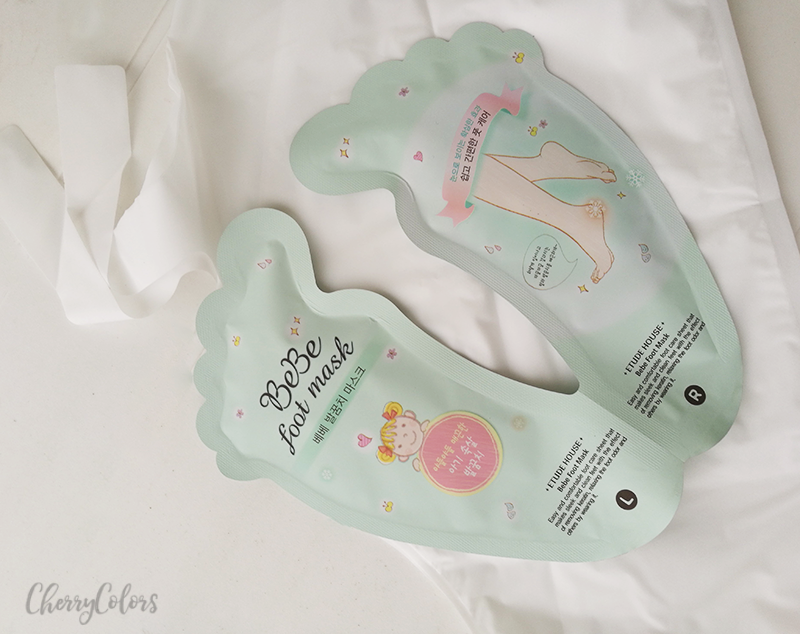 Etude House BeBe Foot Mask (peeling) [GROSS] - Cherry Colors - Cosmetics Heaven! 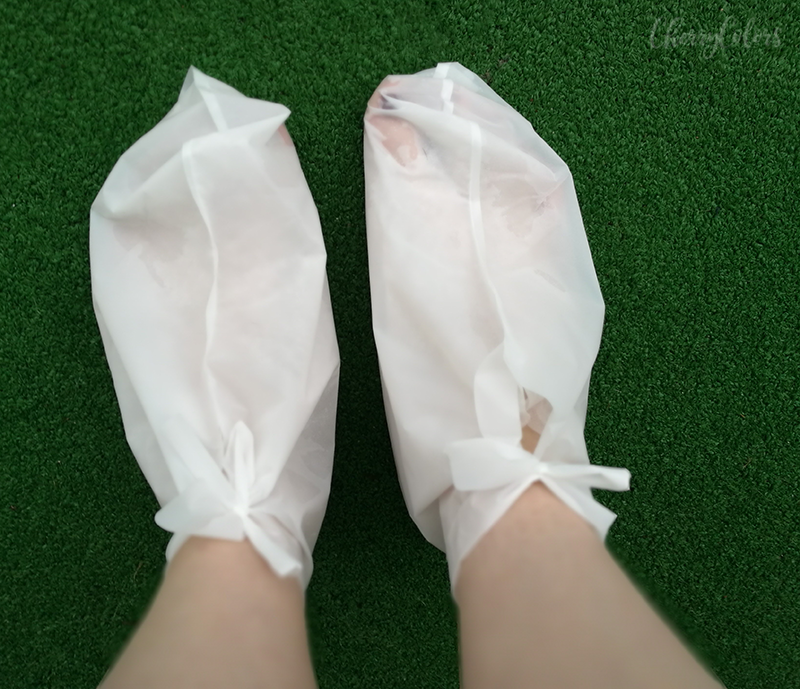 My last experience with a cheap foot mask was less than good and you can read all about it in my post "Are the cheap eBay peeling feet masks any good?". But after that fiasco, I purchased a different brand of foot masks since the market is full of them. One of the cheapest are made by the brand TonyMoly and next in line comes Etude House. I managed to grab mine for $4. I tested them as instructed and the results, well .. they were. Only continue with this post if you can stomach gross pictures. The mask comes in a box packaging that somehow survived shipping. Luckily it comes with them. And also a very cute packaging for the liquid that reminds me of the Holika Holika foot peeling. I had a couple of hours "free" so I could use the mask. The application was easy and I had no problem whatsoever with using the mask. Pour the liquid into the enclosed plastic socks and gently place feet in. Leave on for approximately 1.5 hrs (Alternatively, you may wear the socks first and then pour the liquid in). Rinse off with lukewarm water. (Although this is not really necessary, as the liquid feels like water on one's feet and not sticky at all). The socks were pretty comfortable. I managed to wear them for 1.5 hours without a problem. The liquid has a very pleasant scent that you notice only when you put the socks on and off. The first day there was no difference. I washed off the liquid and went about my day. Day 5: I almost completely forgot about the peeling but once I remembered I was quite disappointed. But then I noticed something. Parts of my foot started to peel. It looked pretty dry even if it wasn't dry. Day 7: The peeling became more noticeable and I had to wear socks all the time or I'd leave parts of dry skin while walking. My heel looked the driest it has even been. It still didn't start to peel. Day 10: Most of the feet has peeled except for the heels. I helped the skin peel a bit after taking a shower. It was disgusting. Dead skin went everywhere and I had to wear socks even to bed. In the morning I had to "empty" my socks and put on new ones for the day. Day 12: Most of the skin peeled off but the heels looked bad. They didn't peel. 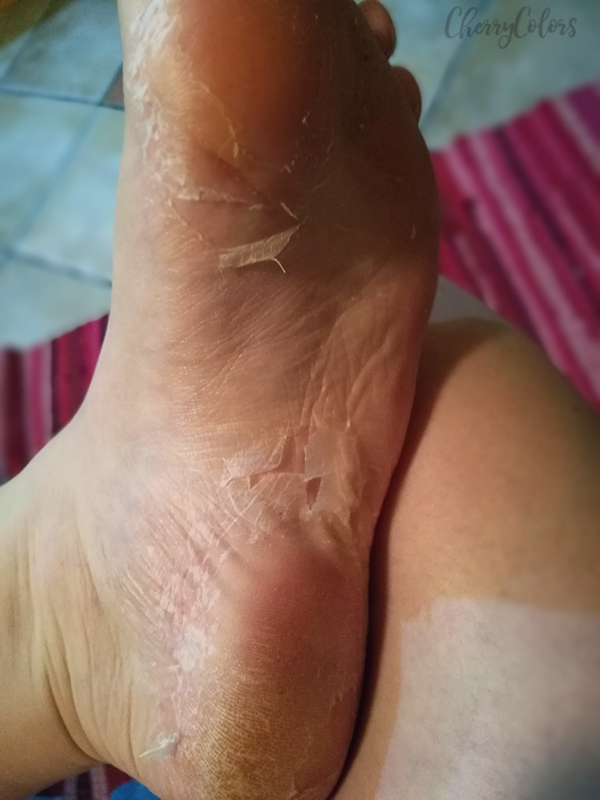 After 14 days I could notice that the peeling ended and I could finally stop wearing socks all the time. I was sad because my heels didn't peel which is also true for those harder parts of my feet. Overall I am happy with the result but I do think I'll need to re-do the process because I want my heels to peel! This mask had an even better effect than the Holika Holika mask and it was also cheaper. Most of my feet were left feeling smooth and soft. Would you try such a foot mask?